Layers of vanilla ice cream sandwiches with hot fudge, homemade whipped cream, snickers bars, and drizzled with caramel topping make this snickers ice cream sandwich cake one sweet summer treat! Ice cream and summertime go hand in hand! Ice cream any time of year is amazing, there is just something about walking down the street or sitting on a bench licking an ice cream cone or scooping up a spoonful of sweet yumminess! Growing up we would celebrate our birthdays with ice cream cake and it was an exciting treat to look forward to! 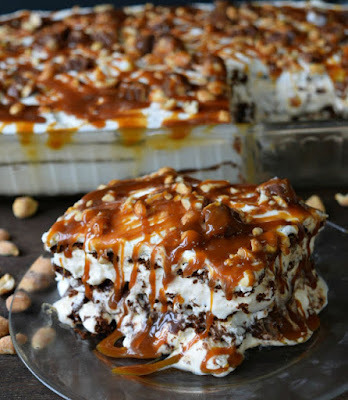 This snickers ice cream sandwich cake is a variation of a similar cake that my sister makes and brings to family gatherings! Whether you are serving a crowd or just your family this snickers ice cream sandwich cake is one lip smacking, mmmmm good dessert! Using a greased 9x13* pan line 12 of the ice cream sandwiches on the bottom. Microwave the hot fudge for 15-20 seconds, stir well. Pour hot fudge over the ice cream sandwiches and spread evenly, place in freezer to harden. In a bowl whip together the heavy cream and sugar until it forms thick whipped cream. Divide the whipped cream in half, and spread one half of the whipped cream over the hot fudge, place in freezer to harden. Chop 12 snickers bars into bite size pieces. Chop the other 6 bars into bite sized pieces and set aside to use to top the cake off. Evenly spread the chopped snickers bars over the whipped cream. 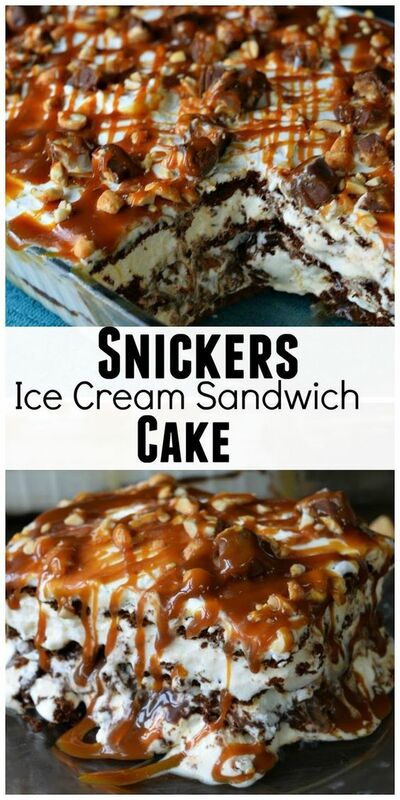 Layer the other 12 ice cream sandwiches on top of the snickers bars. Evenly spread the other half of the whipped cream over top. Sprinkle with the remaining snickers bars. Microwave the caramel topping for 15-20 seconds, stir. Place in a ziploc bag, push to one corner, snip the corner and drizzle caramel over top the snickers bars. Freeze for 3-6 hours before serving! * For a smaller cake you can use a 8x8 pan, just cut the ingredients in half!